If you're in the front line, in the danger zone, ducking bullets from all directions, you need all the help you can get. No-one can move fast enough to dodge a sniper's bullet, when they can't even see it coming. There's only one way to protect yourself: place a barrier in front of your body that will dissipate a bullet's energy. That's the basic idea behind bulletproof glass. Let's take a look at how it works! Photo: There's no such thing as totally bulletproof glass. In this controlled test carried out by the US Air Force, a very powerful AK-47 assault rifle has shattered a piece of armored glass to smithereens. Picture by Gary Emery courtesy of the US Air Force. Photo: Normal glass offers little protection against bullets. When a bullet strikes a pane of glass, the bullet's energy pushes against the glass, making fractures radiate out from the point where the bullet hit along lines of weakness. This is what makes glass shatter into huge shards. Glass damaged like this adds an extra element of danger: if the bullet doesn't kill you, the glass just might. Picture by Bennie J. Davis III courtesy of the US Air Force. If you've ever caught a fast-moving baseball or cricket ball, you'll know the trick is to move your hand back and stop the ball gradually so you reduce its energy very slowly. That reduces the force on your hand so the catch hurts less. Putting it more scientifically, the force the ball exerts on your hand is equal to the rate at which the ball's momentum changes. So if you change its momentum slowly, by bringing it to a halt gradually, the force you feel is reduced. Let's say you stop a ball nearly instantly in half a second and you feel a hefty smack as your hand absorbs the impact. Now suppose you could replay the moment and take two seconds to stop the ball instead. This time, taking four times longer to bring the ball to rest, your hand would feel only quarter as much force—so the ball would hurt you much less. Unlike your hand, a piece of glass can't move. If someone fires a bullet at an ordinary piece of glass, the glass can't bend and absorb the energy very gradually. So it simply shatters and the bullet carries on through with hardly any loss of momentum. 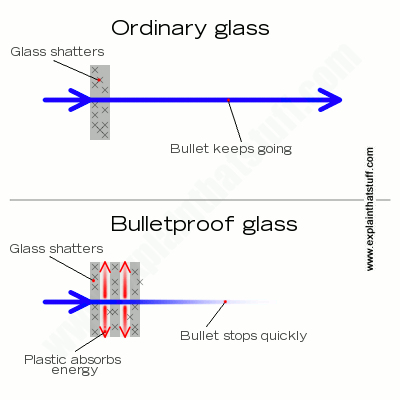 That's why ordinary glass offers no protection against bullets: it is completely ineffective at slowing them down and absorbing their energy. Photo: Top: Ordinary glass shatters and does nothing to stop the passage of a speeding bullet. Bottom: Bulletproof glass shatters too, but the layers of plastic sandwiched between the layers of glass absorb and dissipate the bullet's energy. If it does manage to penetrate through the glass, it will be greatly slowed down and it will do much less damage. 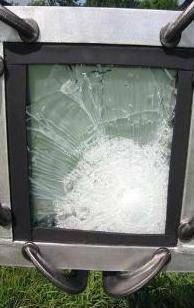 "Bulletproof" glass is very different to ordinary glass. More correctly called bullet-resistant glass (because no glass is totally bulletproof), it's made from multiple layers of tough glass with "interlayers" of various plastics. Sometimes, there's a final inner layer of polycarbonate (a tough type of plastic) or plastic film to prevent "spalling" (where dangerous shards of glass or plastic splinter off following the impact of a bullet). This sandwich of layers is called a laminate. It can be up to ten times thicker than a single pane of ordinary glass and it's usually very heavy. When a bullet strikes bulletproof glass, its energy spreads out sideways through the layers. Because the energy is divided between a number of different pieces of glass and plastic, and spread over a large area, it is quickly absorbed. The bullet slows down so much that it no longer has enough energy to pierce through—or to do much damage if it does so. Although the glass panes do break, the plastic layers stop them flying apart. Think of bulletproof glass as "energy-absorbing" glass and you'll have a good idea how it works. How do you make bulletproof glass? Traditional bulletproof glass is made from alternating layers of glass (typically 3–10mm or &frac18;–&frac38;in) and plastic, where the plastic is simply a thin film of polyvinyl butyral (PVB) (around 1–3mm or 30–90 mils thick). Newer, stronger kinds of bulletproof glass use a sandwich of glass and plastic made of acrylic glass, ionoplast polymers (such as SentryGlas®), ethylene vinyl acetate, or polycarbonate, with the thick glass and plastic layers separated by thinner films of various plastics, such as PVB or polyurethane. Artwork: Bulletproof glass is essentially a multi-layer sandwich of glass and plastic, but there are many different ways of arranging the ingredients. 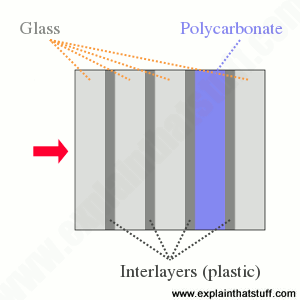 In this example, there are multiple layers of glass with thin plastic interlayers binding them together and one thick layer of polycarbonate—but many other arrangements are possible. Photo: This bulletproof armor withstood the impact of a .30 caliber armor-piercing bullet fired from 23 m (25 yards) away using a Russian M-44 sniper rifle. Picture courtesy of US Air Force. Bulletproof glass comes in all shapes and sizes to give different levels of protection in different situations. You're most likely to find it in places like banks, where the tellers typically sit behind thick bulletproof windows and use bulletproof drawers to exchange paperwork and money with customers. Generally speaking, the thicker the glass and the more layers it has, the more energy it can absorb and the more protection it will give. Basic bulletproof glass ranges from about 3cm (1.185 in) to 4cm (1.59 in) thick, but it can be made twice this thick if necessary. The only problem is, the thicker you make bulletproof glass the heavier it becomes. That may not be a problem in a bank, but it's certainly a consideration when you're trying to bulletproof a president's car or a "Popemobile". Making bulletproof glass thicker also makes it slightly more opaque, because light struggles to get through all those extra layers. That can cause difficulties if it impairs the driver's visibility. Rap artist Buster Rhymes ran into problems in 2007 when police stopped his SUV (with its 5cm/2in-thick bulletproof glass) "for having excessively tinted windows" (only 70 percent light transmission). Chart: You need thicker glass to stop bullets with higher velocities and energies. This chart compares the effectiveness of bulletproof glass rated BR1–7 on the standard EN/CEN 1063. 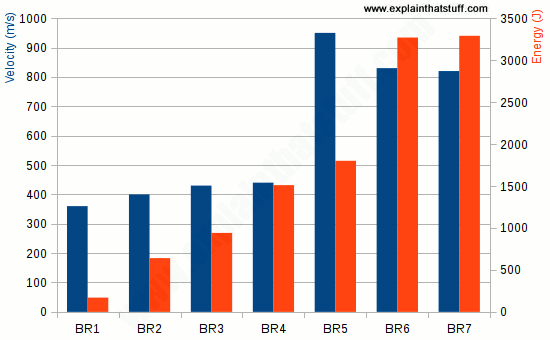 BR1 would typically be around 13–15mm (0.5–0.6in) thick; BR7 would be more like 75–85mm (3–3.5in)—roughly six times thicker. Different standards exist in different parts of the world. In the United States, the effectiveness of bulletproof glass is typically compared using NIJ (National Institute of Justice) Standard 0108 for Ballistic Resistant Protective Materials (September 1985), which lists seven kinds of armor broken into five main types (Types I, II-A, II, III-A, III, IV, and Special). The highest classification, Type IV, must be able to cope with a single hit from a 30-caliber armor piercing rifle with a bullet mass of 10.8g and measured velocity of 868±15m/s. In the UK, the relevant British Standard is BS EN 1063:2000, which compares nine different types of glass (BR1 for handguns and rifles, BR2–4 for handguns, BR5–7 for rifles; and SG1–2 for shotguns). Elsewhere in Europe, that's equivalent to CEN 1063. Artwork: Earl Fix's idea was to sandwich polyvinyl acetal resin (PVA) between two layers of glass. Artwork from US Patent 2,045,130: Safety Glass, courtesy of US Patent and Trademark Office. Modern bulletproof glass is simply a variation on laminated safety glass, and that was invented by a French chemist named Édouard Bénédictus (1878–1930), who took out a patent on the idea in 1909. His original version used celluloid (an early plastic) sandwiched between two sheets of glass. The idea of using polyvinyl plastics in laminated glass dates from 1936, when it was first proposed by Earl Fix of the Pittsburgh Plate Glass Company. Glass: How ordinary glass works—and why it's not what it appears to be! Composites and laminates: How to make amazing new materials by combining ordinary old ones. Energy-absorbing plastics: Plastics that suddenly change form to protect things by absorbing impacts. Kevlar: An introduction to one of the world's most versatile protective materials. 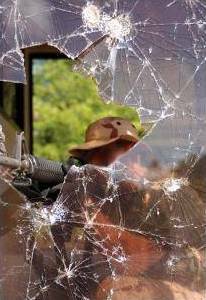 Out of Tragedy, a Protective Glass for Schools by Claire Martin. The New York Times, December 27, 2014. Could an afforable new reinforced glass delay entry to buildings long enough to prevent mass shootings in future? Who, what why: How many buildings have bullet-proof windows: An article from BBC News, 17 November 2011, which introduces the idea of bullet-resistant glass and looks at how bulletproof windows are used in high-security buildings (such as the White House). Road Warriors by Craig Peterson, Popular Science, March 1991. A slightly dated but still very interesting article about the various cunning features of armor-plated cars. 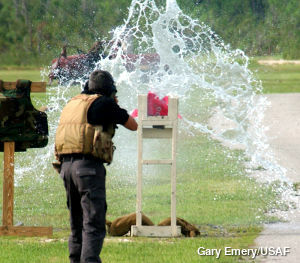 School Guard Glass demonstration: Testing a new-type of safety glass designed to help schools resist shooting attacks. Armored glass demonstration: A fantastic and very persuasive demonstration by Labock Technologies (6 minutes). It's absolutely amazing to watch a sledgehammer bouncing straight back off glass for two-solid minutes! Bulletproof glass demonstration: Watch how bulletproof glass behaves in actual firearm tests by BP-Glass. As you watch this video, notice how the tester handles the glass planes: you can clearly see their thick, laminated construction as he reaches down and tilts them. US Patent: US20100024692A1: Blast and impact resistant window pane systems: by Zvika Bar (Oran Safety Glass), December 2, 2014. Describes cutting-edge explosive-resistant glass. US Patent: 5,445,890: Bullet-resistant glass/glass, glass/plastic, and plastic/plastic laminate composites: by Charles E. Bayha and H. Arne Sudlow (Resikast Corporation), June 6, 1994. Contains a good, clear description of how bulletproof glass/plastic laminates have traditionally been made (briefly summarized up above) and an alternative, novel method proposed by the inventors. US Patent 2,045,130: Safety Glass: by Earl Fix (Pittsburgh Plate Glass Company), June 23, 1936. The first patent for laminated safety glass using a polyvinyl acetal resin sandwiched between two sheets of glass. Laminated glass: technical FAQs: Some useful questions and answers from DuPont. British Standards BS EN 1063:2000 and CEN 1063: A basic summary from Wikipedia. Text copyright © Chris Woodford 2008, 2018. All rights reserved. SentryGlas is a registered trademark of E. I. Du Pont de Nemours and Company.